Autumn means pumpkin time. As the world (so it seems) prepares for Halloween, you cannot avoid pumpkins and pumpkin shaped items wherever you go. Me, being a German, don't really have much experience with Halloween and pumpkins. Halloween was basically non-existent, when I was a kid in Germany. I also don't recall pumpkin being a regular food during the fall months. However, things are different now. We live in Dubai, probably still not a major region where Halloween is being celebrated. But with a huge expat community out here, ones gets to know all sorts of celebrations and holidays, the American ones, the Chinese ones, the Indian ones. My two kids are totally crazy about Halloween. Their costumes for this year's trick or treating are ready. And they do love pumpkin. Not the steamed variety on their dinner plates (it's probably asked too much from their health-conscious mother), but "hidden" in cakes and soups. In my search for a nice pumpkin bread recipe, I found many using canned (and sometimes fresh) pureed pumpkin. Firstly, I have never seen canned pumpkin in any shop in Dubai or Germany. I must admit, the thought of canned pureed pumpkin doesn't appeal to me at all. Pumpkin is such a cool ingredient. It cooks in no time, it has such a fresh and vibrant color. Why use it from the can in which it has been for months? It was probably cooked to death before being put in a can. And then I ask myself, why wait for fall to bake a cake with canned pumpkin that has a shelf life of several years? I don't get it. 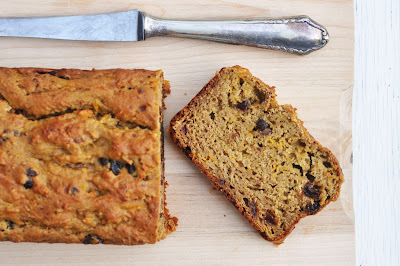 Now here is the style of pumpkin bread that I like: as pumpkin has a similar texture as carrots, I simply use it as I would do in carrot cakes: raw and grated. That is all there is to say. 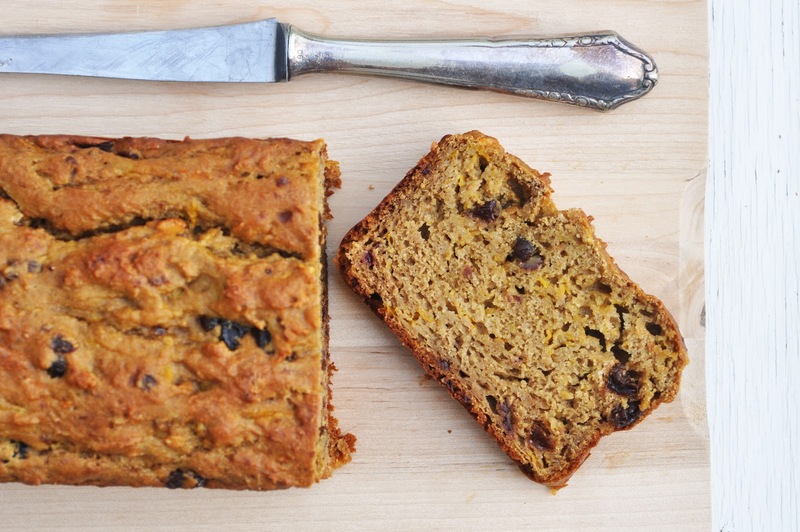 It makes a lovely color, I loved the sweetness coming from a combination of dried dates, pumpkin and raisins. A healthy bread or cake, good for at any time of the day; breakfast snack or tea. Combine dates and yogurt in a food processor and blend until the dates they have become a paste. Add the egg and the oil and pulse a few more times to incorporate. Set aside. In a large bowl, sift together flour, salt, baking powder, baking soda and cinnamon. Pour wet ingredients onto dry ingredients and stir until just combined. gently fold in the grated pumpkin and raisins. Transfer batter to prepared loaf tin. Bake for 45 minutes or until toothpick comes out clean.